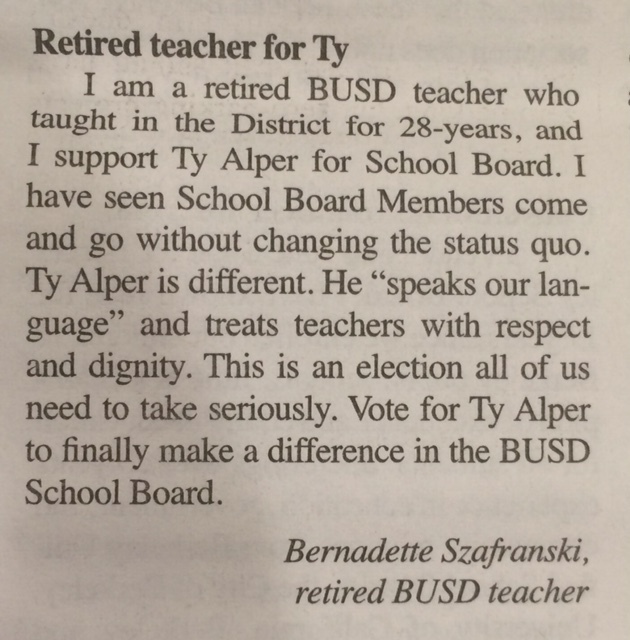 Here are some of the letters from current and former BUSD teachers in the recent Election Edition of the Berkeley Times. Click on the letter to read a larger version of it. 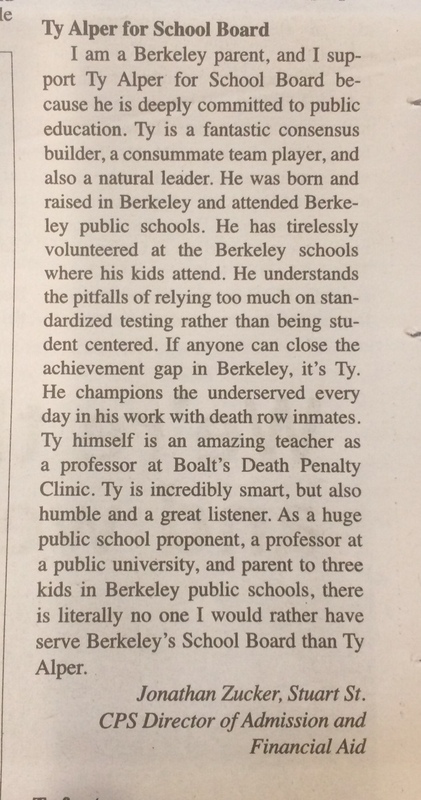 As I have said before, editor Todd Kerr provides a great service to the city in the Berkeley Times (more info here: http://berkeleyx.org/). 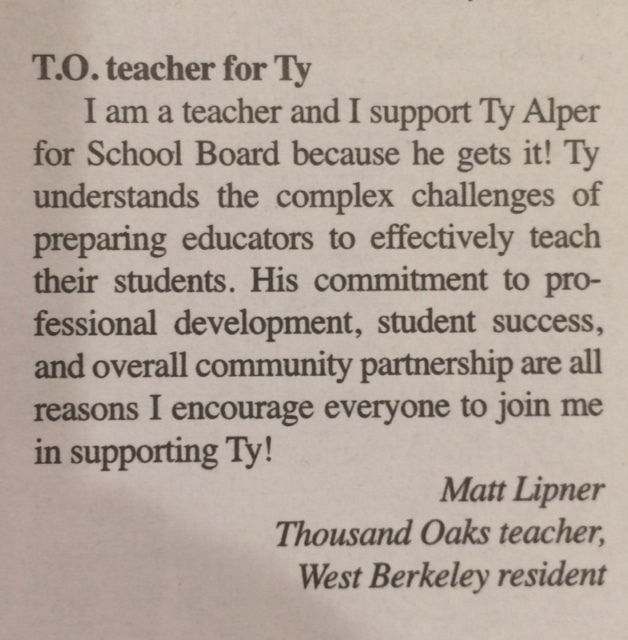 The Times‘ Election edition featured a number of wonderful and humbling letters in support of my school board campaign. I’m going to post some of them here over the next few days, and also on my Facebook page. 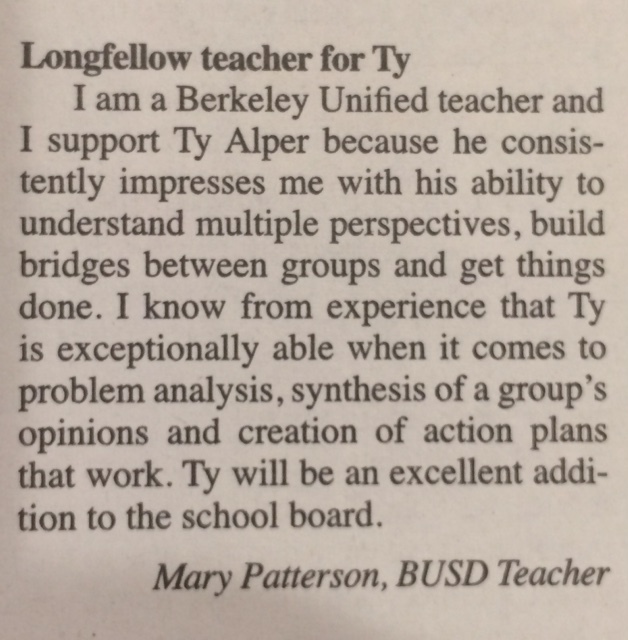 There are two school board candidate forums coming up: October 16 at 7-9pm at the Thousand Oaks Baptist Church (corner of Catalina and Colusa), and October 28 at 7-8:30pm at King Middle School. Hope to see you there! The School Board just approved Dr. Evans’ proposal to add a Vice Principal at Malcom X, and the District will post the position tomorrow. This is welcome news for the Malcom X community, and the new administrator will be in place, assuming the search goes well, in a month or so. Stopgap measures make sense in a crisis situation, and the enrollment at Malcom X has reached that point. But the need for stopgap measures indicates a corresponding need for better and more robust long-term planning around issues of enrollment and facilities than has occurred to this point. That long-term planning needs to happen now. 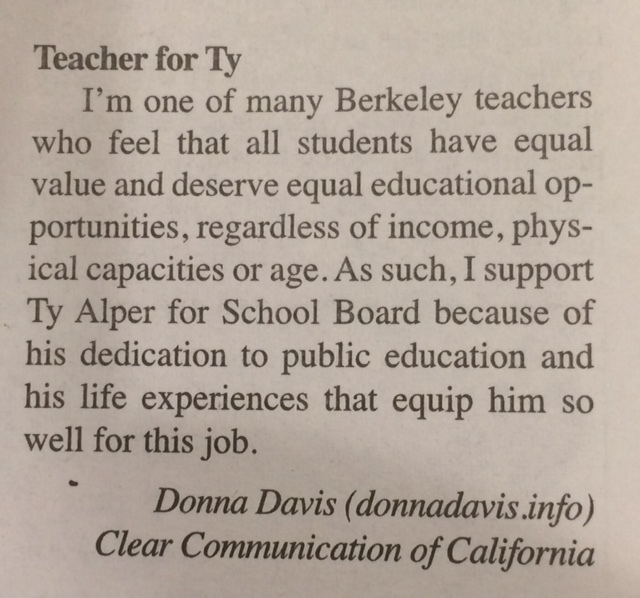 The overcrowding at our elementary schools is an issue that is at the forefront of the minds of a number of Berkeley parents, particularly those (like me) with children in elementary school. In short, the recent confusion over kindergarten enrollment numbers has not inspired confidence among elementary school communities who are frustrated by inconsistent explanations for the decisions that are being made. The Board should direct District staff to research and present the options available to solve the problem (none of which are easy fixes) through an open and transparent process that results in a long-term facilities plan. Overcrowded schools negatively impact student learning. This is common sense, but it is worth making explicit why it is a problem for “flex” classrooms that are used for teacher prep, art, science, or music to be re-purposed into regular classrooms. When that happens, teachers lose the critical ability to prep in their classrooms and instructional time on task gets lost in transitions (as classrooms are transformed from one purpose to another). And then, of course, the sheer numbers of students at a school that is not designed for that many people can impact yard safety, cafeteria scheduling, and the ability of the school to conduct all-school assemblies and community events. A number of our elementary schools have recently lost “flex” classrooms. Other elementary schools in the District long ago lost these rooms. At my kids’ school, Rosa Parks, we have at times had makeshift classrooms on the stage of our auditorium and in a cramped computer lab separated from the other classrooms. The fact that most of the elementary schools have now lost their flex space highlights that this is a District-wide problem that needs a long-term District-wide solution. The impact of the state-funded Transitional Kindergarten (TK) program on our facilities cannot be denied. TK is a wonderful program. But the state funds allocated for it did not include funds for facilities, which means that, this year, the District had to accommodate, without additional facilities resources, seven TK classrooms (compared to four last year). The TK population should hold steady over the next 5 or so years, so it now makes sense to think of, and plan for, the “TK-5” student population in the elementary schools. The problem is going to get worse. The demographic study the District commissioned in January 2014 (available here) is projecting an increase in Kindergarten enrollment next year of more than 100 students. We need to start planning for that increase immediately. It doesn’t work for every elementary school to have the same amount of administrative and support staff, regardless of the number of students at the school. A sensible approach would be to have a minimum level of staffing at every school, and then a long-term, transparent formula for additional staff based on the size of the school. Such a formula exists at the middle school level for administrative staffing, and it is not hard to envision how one could be developed for the elementary schools. While a long term solution is explored, there should be swift action to provide at least temporary relief to the schools that have significantly more students than other elementary schools. The District must place a premium on clear, candid communication to affected communities. Here’s a post from last year about their wild school photos. Robert Reich endorses the campaign! 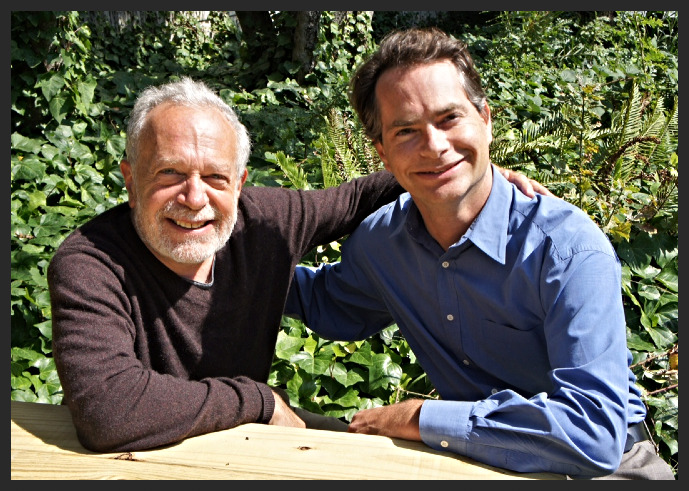 Robert Reich is a hero to many of us in Berkeley for his advocacy on behalf of working Americans. He is also an educator who has written eloquently about the need for our public schools to prepare students for a changing world. 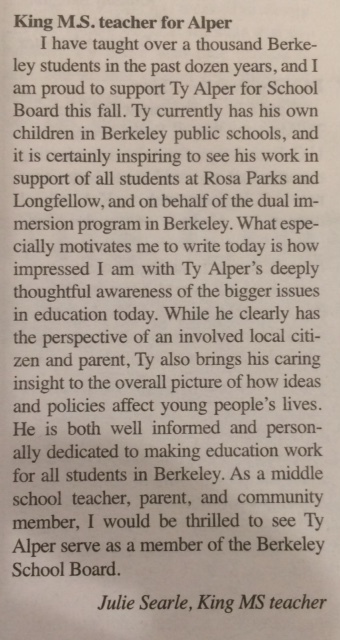 He believes that we will eliminate the achievement gap not only when we eliminate racial predictability in test scores, but when we also ensure that all students emerge from their schooling with a love of learning, and the ability to think creatively, collaborate, and apply what they have learned to new contexts. 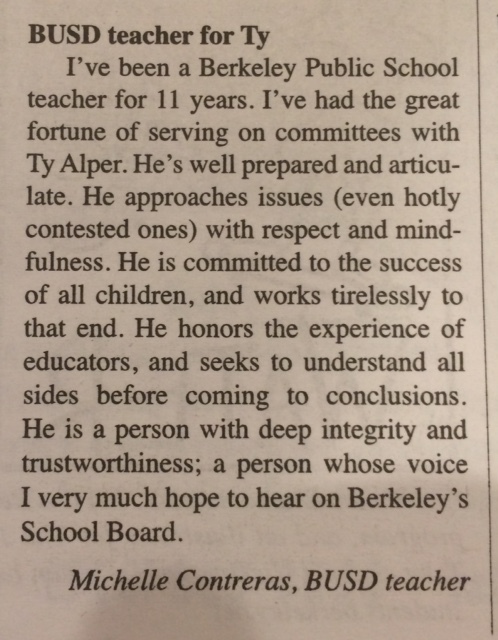 I am very proud to announce that Professor Reich has endorsed my campaign for school board!